Winter is coming: is your fleet ready? Although the sun is still shining, the chilly mornings are starting to creep in. My Fleet Solutions has some support to get your fleet in shape and advice from the Institute of Advance Motoring to prepare your fleet, your drivers and you, for the colder weather that’s nearing us. Check tyres. The legal limit of a tread depth may be 1.6mm but anything under 3mm will see a potential fall off in grip and braking performance. But, there’s more… planning for really bad weather, can take a lot of time and thought. At My Fleet Solutions, we understand that managing a commercial fleet is more challenging than ever. That’s why we are introducing a free, one-stop solution to deal with the never-ending list of problems you face: MyService.Expert is a service, maintenance and repair dashboard where you can manage any work, including MOT that needs to be conducted on your vehicles. For a pre-winter check up, why not try it? It just takes three steps to register and it’s completely free to book any of the integrated services included in the system, to help service, maintain and repair your fleet. Once your vehicles details are in place, the user-friendly dashboard allows access to a nationwide garage network with great savings on fleet servicing, maintenance, repairs and MOTs, at the right price for your vehicle. 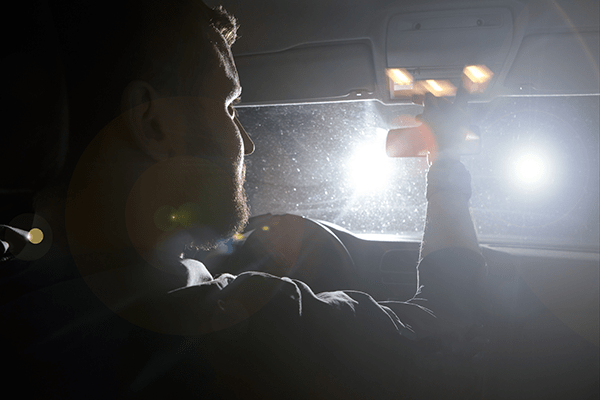 You don’t want your drivers stranded in a cold car in the middle of night waiting for the recovery team to get your vehicles up and running again. It’s always best to keep an ice-scraper and can of de-icer in your vehicle as the British weather is so unpredictable, and can be sunny one day and frosty the next. Carry an empty fuel can with you. Don’t carry a full or partially full one as this is a fire hazard and if it has recently had fuel in it, flammable vapour may still be present. You never know when you’ll need a first aid kit, so keeping one in the boot of your car is always handy for either yourself, or another road user if you’re first on scene at an accident. If you’ve broken down on the side of the road, the last thing you want is to be cold and unable to see your way around the dark. That’s why we advise drivers to always keep a torch and set of batteries in their vehicle, along with warm clothes, a blanket and a high visibility jacket. And don’t forget food and drink to stop your energy levels from dropping – bottled water is a must. The battery on a car can go flat at any time. Make sure your vehicles have a set of jump leads so your driver can start your engine with help from another driver’s vehicle. Keep a spare pair of sturdy shoes with a good grip. You’ll need these to turn the wheel brace when changing a tyre, or to push your car if you’ve broken down, or even just to change shoes if there’s a sudden weather change. Last but not least a quick survival kit in the boot. Spare clothes, a torch, mobile phone charger, some emergency rations such as water, chocolate and a tow rope and shovel to help yourself and others. 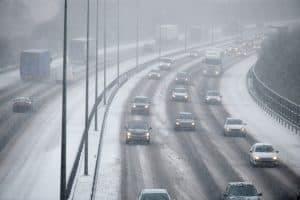 For further information on driving in winter, and 10% off an Advanced Drivers Course, visit our sister site Drivers Club. The post Winter is coming: is your fleet ready? appeared first on FCS Media.